We are making halfling skeleton warrior cavalry, mounted archers, and a halfling skeleton necromancer for the halfling skeleton army! Halfling Skeleton Army: Last Halfling Skeleton Kickstarter Up! The last halfling skeletons are now up on kickstarter. These are halfling skeleton halberdiers and war machine crews. I'm not sure if I am going to continue to sell them after the kickstarters or not so this might be a good time to get you popcorn! More Halfling Skeletons are Rising for Snacks, and Bacon, and Ducks! The halflings will come marching home again, hurrah, hurrah! The next halfling skeleton kickstarter is ready to go and will launch soon (I hope)! The masters are done and I have asked our caster to start on the production molds. My hope is get them out to you at the end December. One of our number has a new kickstarter up you may want to see! I keep wanting to get some of his ducks but just don't seem to have the money or painter inline to paint them. ORCYs Over the Horizon! The Orc Skeleton Kickstarter has launched! After a long or short wait (depending on how you see it), the orc skeletons are out! These boyz will add diversity to your undead army! 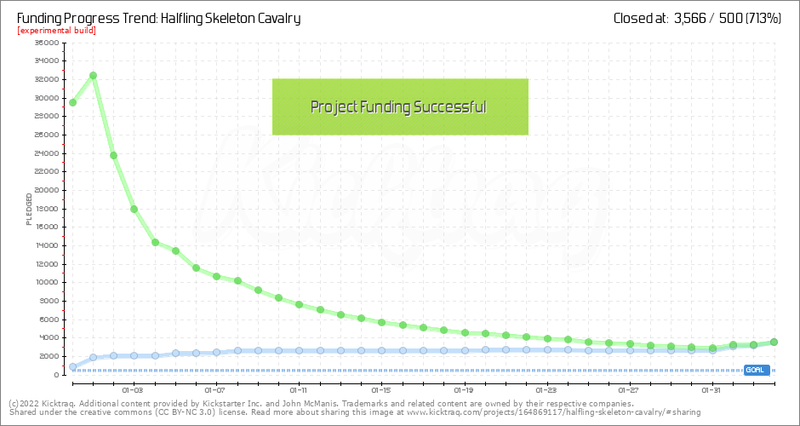 Halfling Skeleton Army Cavalry Kickstarter: What's Cooking! In the next week we should be launching the next kickstarter, BUT it won't be halfling skeletons. These guys are orc skeletons to add a bit a weight to the army! Not to fear we will have the next set of halfling skeletons out very soon! Masters have been made. We are waiting on the production molds and having samples painted up now. By popular demand (by popular demand I mean a very few people, mostly Billy) they will be halfling skeleton halberdiers and 3 different(ish) sets of halfling skeleton war machine crews! Halfling Skeleton Army Cavalry Kickstarter: All Pigeons Have Left the Roost! All Packages are in the mail! Today I sent out the last of the packages! 90% of the next kickstarter is ready! Hopefully it will launch in the next month. It is a bit different though, orc skeletons! It will be followed by the kickstarter that will give you a halfling skeleton halberd unit and the halfling skeleton war machine crews that have been requested. Both kickstarters will probably run concurrently so that everyone can have both sets of stuff by the end of June (God willing!). I've been putting in a lot of hours at work so I am short on jokes but I will steal one from the Muppets. Why did the duck cross the road?